Remember the last time you popped into a sauna while at the spa? Well, it’s well known that the heat in any sauna is relaxing and helps you produce a good amount of sweat. Why wait until you get another spa day? Just set up a sauna at home to indulge more frequently. For the most benefit to your health, it’s important to use the right type of sauna for therapy and the right type is called near infrared. 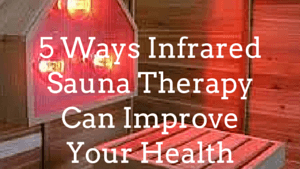 A near infrared sauna uses incandescent heat lamps that feel great on bare skin! Skin Rejuvenation – Softer, more pliable skin can be yours! Sauna therapy cleanses your skin from the inside out by suppressing your sympathetic nervous system while increasing sweat production causing your pores to open while at the same time decreasing secretion of the sebaceous glands. This can help conditions like acne, eczema, dermatitis and psoriasis. Decongestion of Internal Organs – While your body and skin surface warm in the sauna, blood is redirected away from your internal organs toward your skin giving your organs a much needed break. Toxins can then be released through the skin reducing the overall burden on your organs. Enhanced Detoxification – The sweat produced in an infrared sauna is different from the sweat that streams out of your pores during an intense workout. The sauna is relaxing and moves your nervous system into a parasympathetic mode versus the sympathetic mode required for exercise. Elimination of toxins is enhanced while sweating in a parasympathetic state. Increased Alkalinity – Toxins have an acidifying affect on the body by impairing circulation and the elimination of metabolic end-products. Sweating improves acid-alkaline balance in the body. Improved Oxygenation – Infrared sauna therapy sends more blood to the lungs and the skin as body temperature rises. The blood picks up more oxygen in the lungs and skin that is then moved throughout the body. This is very beneficial in clearing bronchial and lung infections. Start with a few minutes and work your way up to 40 minutes, 10 minutes on each side of your body (front, left side, back, right side). It’s best to relax and work on your breathing or even meditate while in the sauna. Getting started with a near infrared sauna is well worth the effort and expense. You can purchase one of these from Sauna Space or make your own with these instructions. This is one of my favorite ways to relax and detoxify! Is sauna therapy something you are familiar with or a newly introduced tool for your health? Great article. 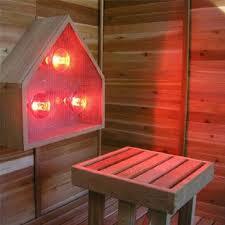 Infrared saunas are also very beneficial in eliminating/detoxing heavy metals deep with in your body. Be careful to address emf (electromagnetic frequencies) in whichever sauna you use as you would not want to be absorbing those electronic toxins while detoxing chemical and metal toxins. Thanks Toni for sharing! Yes, exactly Melissa. That’s why I recommend near infrared saunas. There is more EMF exposure with far infrared saunas so I avoid them.